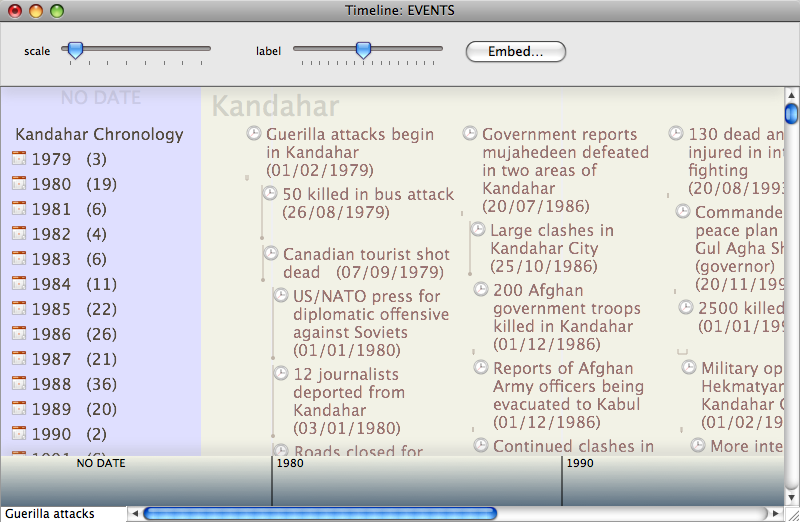 A new major view, added in v5.6.0, displays the notes inside a container as a horizontal timeline. Each note is positioned along the timeline based on its $StartDate. The note's width is based on the value of $EndDate, if specified. From v5.7.0 there is limited support for negative (BCE) dates. Double-clicking in the timeline create a new note. The note will automatically be assigned a StartDate corresponding to the timeline date of the clicked location. Events may be assigned to distinct horizontal bands in the timeline. For example, one band might describe political developments and a second might describe artistic landmarks, or one band might specify development milestones while another would involve documentation or marketing. The band for an event is specified by the attribute $TimelineBand; notes may be dragged between bands which will reset the attribute accordingly. Dragging a note beneath the bottom-most band creates a new band; empty bands are automatically deleted or not drawn if higher-numbered bands exists (i.e. only bands with data are drawn. From v5.10.0, opening a timeline on a note with no children opens that note's container as this is the more likely intent. Note: Until v5.9.3, if no notes in the container had a $StartDate, Tinderbox used $Modified instead; this alternate option was discontinued after v5.9.3. More detail on the Timeline view is given here.